What. A. Whirlwind. That is all I can say about this weekend. I am sitting here on Sunday night thinking about my meal plan and it doesn't seem like the whole weekend could have gone by already. It was such a busy weekend! Practices, rehearsals, hair appointments, parties, Sunday school, and some Christmas shopping! This week does not settle down at all, that's for sure! We have something every night this week, but a little less going on next weekend so a little rest before the big holiday!! I am still in my cleaning out the cupboards faze of prepping for the diet. Start date December 28th! So this week, is more of the same. Clearing out non-diet foods from the house and celebrating! Peanut butter sandwich, tomato soup or dinner leftovers. Monday - Sandwiches - we will be eating in the car between activities tonight. Tuesday - Pizza - we are having friends over for pizza and some Christmas movies! Wednesday - Breakfast for dinner - I have dinner with book club, but Mike and the kids can have pancakes or eggs with fruit. Thursday - Hot dogs - I have dinner plans with some friends, so Mike and the kids are on their own again. Friday - ??? We always have pizza on Friday night, but I hate to have it a second time in a week, so we might have to wing this night or we'll have pizza. Although I should eat a salad since I will have eaten out two nights in a row! Not the healthiest meal plans I have ever seen, but two weeks from now, it will be a whole different story! We will be settling down after Christmas and Mike and I will be settling into our new habits! I am very much looking forward to this new adventure! Linking up today with Laura from Mommy Run Fast and Laura from I'm an Organizing Junky! 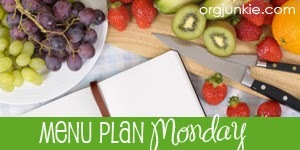 Want to see more great meal plans, head over to their blogs! Want to know more about Carb Cycling, the diet, I am getting ready to start? You can read about it here and here. I will also be documenting the whole process coming up in the next few weeks! The weekends always seem to go a little faster during this time of year. I am excited to hear more about your new habits/diet starting 12/28. That's not too far away!! I know! It's coming right up and I am actually looking forward to it! I didn't think I would ever say that about a diet, but this one just makes sense to me and seems doable with our life! I am also really excited to document it. Weekends are crazy this time of year!! Enjoy the holidays and getting started on carb cycling!